Today I traveled through Boston, Massachusetts, by way of the Independent Chronicle dated November 19, 1812 , where I found an Official report from John Rodgers. 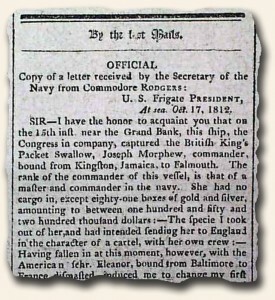 The U. S. Frigate President had captured the British Packet Swallow and the rank of the commander of the vessel being the master and commander in the navy. “… She had no cargo in, except eighty-one boxes of gold and silver, amounting to between one hundred and fifty and two hundred thousand dollars…”. I would say that was a pretty nice cargo! Also within the issue was the proposal of a new newspaper, that being the Baltimore Patriot. In slightly less than two years, this publication would be the first newspaper to publish The Star-Spangled Banner on September 20, 1814 (Note: Just for an FYI, it appeared within a week in a Washington, DC paper  as well).